In this video, we're going to be dealing with one of the most difficult question types on the GMAT reading comprehension, and that is the inference question. Related to the inference question, is the implied question. Which is also very difficult and both question types, of course, are common at the higher levels. 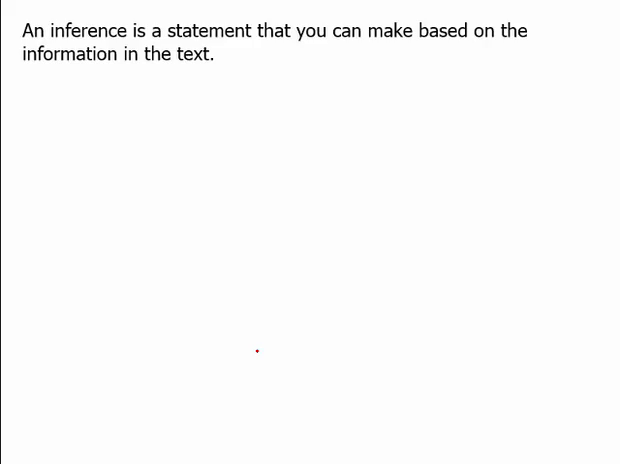 As you'll notice in the definitions here of what an inference question is and what an imply or implication question is, is that the answer is not directly stated in the text. However, it is something that is closely tied to the text or based on the information in the text. So inference and imply questions are very similar in that they are the only questions in which the supporting text is not directly stated. The tricky part is knowing just how close your inference is to what is actually stated in the passage. In other words, you may think something is a valid inference, but on the GMAT, it's actually not the case. What typically happens is that when you look at an answer choice on an inference or an imply question, you often think, aha, this makes sense, it could be, or it might be true. The difference of course on the GMAT though, is that a correct answer to an inference question must be true. To illustrate this, let's take a look at this following excerpt. Rather, oligodendrocytes in human brains lose only 1 per 300 cells every year, a state contrasting greatly with that found in the brains of mice and rats, in which the oligodendrocytes are replaced every time the animal needs to produce more myelin. Based on this excerpt, can we infer the following, the brains of humans and the brains of mice are very different. Now, this might seem like an obvious answer. It just jumps out at us. The GMAT is very good at crafting those answer choices. However, this answer choice is incorrect. Why? Well, the passage just does say that the human brain is very different from that of the brain of a rice, mice, or rat. However, does it say the brain of humans in general is very different. And it does not. It instead focuses on the differences in terms of myelin regeneration. So had this been less general, the brains of humans, we don't really know, at least based on the passage, if the brains in the humans differ on a general level. But, we do know that they differ in terms of myelin production. So the first example assumes too much about brains in general, whereas the second example focuses on what is specific, and therefore would be the correct answer. Now let's try a couple of others. The human brain loses cells that are not categorized as oligodendrocytes. Now, we can see that the human brain loses oligodendrocytes, we can arrive at the conclusion that, oh I see, there are other brain cells and those too probably die. We all know that the human brain loses cells, so I'm guessing that it could be the case that the brain loses cells that are not oligodendrocytes. Now what I did there, was I used, I'm guessing, seems, probably. And you can see that I'm on shaky ground in this gray area of what makes something not a valid inference. When I assume too much, even if it is based on real world information, if it is not found in the passage, I cannot make these logical leaps. The next example, the human brain loses oligodendrocytes, albeit not as many as ri, mice and rats do. So does the human brain lose oligodendrocytes? Yes, it's stated in the passage. And it's also stated in the passage that mice and rats do, but they lose them rapidly and they always have to replace them every time they need more myelin. So this would be the correct answer? Well, no. The twist here is this is too direct, meaning it recapitulates, or states again, what is directly stated. Therefore, it is actually not an inference, but again, a restating of the text. So an inference must take information in the text, just as two did. And put that information together. What I mean by that is we have the information here that oligondndrocytes are replaced every time the animal needs to produce myelin, and therefore that contrast to the human brain. And therefore, we can make the connection that in terms of myelin production, the two brains are very different. Let's try another statement. The human brain does not need to replace oligodendrocytes to produce myelin. Well, based on the passage, does it actually say that? No, it does say, however, looking at the structure, that in contrast, we have the rat brain which does need to replace oligodendrocytes to produce myelin. Therefore, we can again make the connection that, aha, the human brain does not need to replace oligodendrocytes to produce myelin. So, that would be a valid inference. So, what I've done again is make a connection between what is stated in the text, though, what is not explicitly stated, but again, taking two parts of the text and putting them together to arrive at this airtight conclusion. And again, it's not explicitly stated in the text, but based on what is stated, it must be indisputable. And that's important. Connection cannot be disputed so as soon as you find yourself using words such as it could be, or may be or it seems so, and you are taking these leaps of logic, you know that you are on shaky ground. And most likely, the answer that you 're looking at, that is causing you to say could be true, might be true, is most likely incorrect. Now let's take a look at a longer passage here. But I'm dealing with essentially the same information just to make it easy. Just to exemplify what an inference is. So, you can read this really quickly. I'm assuming you have. And now I'm gonna move on to the actual question. Again, the focus is very similar to what we just went over regarding oligodendrocytes and myelin sheaths. In the human brain, it can be inferred that. So, let's look here at answer choice A. And what I'm doing is I'm, I know where it is in the passage. You might as well know where it is in the passage. Again, it's information right here. But when we are dealing with inference questions, oftentimes we want to read the answer to determine whether or not it is a valid inference. This can differ both, as far as other question types go where we back to the passage and think up the answer in our own words. A strategy that I've definitely hammered in throughout these lessons. However, with inferences, it's a little harder to come up with that inference, and therefore, go through each answer choice, starting with A. Not all of the oligodendrocytes are used at one time to form myelin sheaths in the human brain. Does it say that explicitly? No. It does say that 1 per 300 cells are lost every year, and that is very different than the rat brain, in which oligodendrocytes are replaced every time the animal needs to produce myelin. Aha, therefore, it can be inferred that the human brain does not need to replace oligodendrocytes, it has them all, all lined up, they're ready to go. That's why the brain is so plastic. And therefore, going back to your answer choice A, not all of the oligodendrocytes are used at one time to form myelin sheaths just as many as are needed is the correct inference. Because again, the human brain isn't using all of the oligodendrocytes. Choice B, new oligodendrocytes must be formed in order to provide more myelin. So this explains or describes the brain of a rat, not the brain of a human, so that requires close reading. C, oligodendrocytes provide other uses to the brain besides as cells forming myelin sheaths. Now, this is a tricky answer choice, because it seems likely that sure, oligodendrocytes probably do something else besides just myelin. And you may even read deeper into the passage where it talks about how oligodendrocytes may be involved in, how both hemispheres work together. However, we don't know for sure whether or not the hemispheres working together are based on myelin sheaths themselves. And also, the question isn't about both hemispheres, but specifically myelin sheaths and oligodendrocytes. And so for that reason, C is wrong. So again, two reasons. You had to infer a little bit too much about what could be likely the case, and therefore, probably not the answer. D, an average human will lose most of his or her oligodendrocytes in a lifetime. Sounds reasonable. Well, it says that oligodendrocytes is 1 per 300 cells every year, so somebody lived to be 300 then, well, likely that could be the case. But of course, that's absurd. And therefore, D is not a valid inference. E, the number of oligodendrocytes required to produce myelin changes in response to brain trauma. This brings in information that comes deeper in the passage and therefore it's tempting. It also seems common sensible to say huh, brain trauma seems like we're gonna be needing a lot of oligodendrocytes and therefore they're gonna need the backup and, what am I doing? I'm bringing in assumptions that aren't in mentioned in the text. So again, base it on what it is explicitly said, usually two parts. And then put those two parts together to form a valid inference the way we did with A. But don't just start making assumptions based on stuff on the pa, in the passage and therefore, assumptions that are reasonably true based on one or two things, but not necessarily backed up directly. So we can get rid of E. Now, what you'll notice here is that the wrong answer traps are very specific to the inference questions. We had B up here that was a trap answer. That's more common talking about another part of the passage or referring in this case to the rats and the mice. A little trick. But some of the assuming too much is definitely specific to the inference question. Now, let's do one more. Again, I'm gonna have you pause this and read the entire passage which should not be new to you, it's the other passage we've been using. Okay, I'm assume you've paused it and I'm gonna show you that extra part. Okay, I've seen you've read that too. Now, let's have an implies question. The passage implies that Carsten's view regarding the population increase in the US between these years is incompatible with which of the following? So we can see here that Carsten disagrees. With whom? Well, there's Murray, first off, and he talks about optimism. People were optimisist, optimistic and therefore they had more children. Then we have Kimbell. Kimbell says that it really wasn't about optimism. It was the fact that women returned home and were essentially homemakers again. They had no intention of going back to the factory. Carsten says that this views, both of these views are lacking. He says, for instance, large numbers of women, women who started families continued working in factory jobs. And so this goes against, strongly goes against what Kimbell is saying. He also says that families were ready to go, ready to have the woman go back to work if necessary. Or to have both the man and the woman working. And the idea of women only wanting return home having no intention of going back to the factories clashes with what Carsten is saying in terms of what Kimbell is saying. Therefore, the two views are incompatible. Notice that is never said explicitly in the passage, but we can go back here to answer choice B and we can circle the correct answer. Here, I was able to make that inference by looking at the text, not necessarily having to go through each answer choice but sometimes that isn't possible so you will have to go through each answer choice as we'll do here. Stating with A Murray's view. Murray's view is what about optimism. And optimism in general. The author, or not the author, but Carsten's view is that is wasn't just optimism in ge optimism in general, but optimism specifically because people, families realized that they had more economic options or more economically self-sufficient because both man or the woman could actually make money. Is that incompatible? No. What Carsten is doing is qualifying or making more specific what Murray is arguing, and therefore, his view is not incompatible. C, the view of the author of the passage, well, we never really know what the author's view is. D, a view focusing on the fact that the majority of families raising children, only the man worked. Carsten is not saying that because both the man and woman could work, therefore the woman usually did work. He's just saying that perception led to an optimism, that led to them having more children. E, evidence suggesting that women factory workers at the time were also bearing children. So this doesn't necessarily clash with what Carsten's saying. He's saying they went back to the factory, and they were still able to have children. So if anything, that's consistent. And again, based on the passage though it's not directly stated, Carsten's view is incompatible with Kimbell's view. So to quickly recap, inference questions and imply question are based on the text. You must go back to the text and put a couple of parts of the text, usually that are very closely, close together. Put those two parts together and write it an inference that is airtight, that is indisputable based on that information versus one that is could be, kind of, maybe and seem so. The best way to see this in action is to now go through official questions in the GMAT OG guide official imply and inference questions and apply what you've learned here.